The Undergraduate Research Opportunities Programme (UROP) is a scheme run by Careers at the University of Reading, enabling undergraduate students in the middle of their degree to work alongside an academic and gain hands-on research experience. They typically work for 6 weeks during the summer, although part-time options are available, and are paid a reasonable salary financed by the University. They are, essentially, a paid intern, working alongside a supervisor and assisting them on a given research project; the supervisor is responsible for writing the proposal, which is then assessed by Careers and funded if deemed appropriate. Despite the scheme running since 2006, this was the first year I applied to UROP. My proposal was accepted, intended to look at the West African Monsoon (WAM) and how its behaviour has changed in the geological past, present and future. The primary research question was, in its simplest form: Can we use the past to shed any light on the future? This was designed to complement existing research, as part of the much larger PACMEDY project involving several members of the Department and many other institutions. Research into WAM variability is of great importance, as West African societies are heavily reliant on rain-fed agriculture. Failure, or even just a weakening, of the monsoon can have devastating impacts such as drought, crop failure, famine and other resulting socio-economic issues. Under most scenarios of future climate change, it is believed that the WAM may provide more extreme heavy rainfall events, whilst at the same time becoming more erratic (Biasutti et al. 2008; Diallo et al. 2016). However, there is high uncertainty with many studies disagreeing as to even the sign of change of the WAM, let alone its magnitude or intensity, so one way of assessing our climate models’ projections is to look into the geological past, when analogous climate conditions existed. One example of this is the Mid-Holocene (MH), roughly 6000 years ago, when the WAM was significantly more intense and spatially more extensive, due to a different orbital configuration (Gaetani et al. 2017). This can be seen in Figure 1, where a stronger monsoon extending across West Africa is shown , with a reduction in mean rainfall along the Guinean coast. The project, therefore, was to compare the behaviour of the WAM over three separate climate states, something currently lacking within the scientific community. 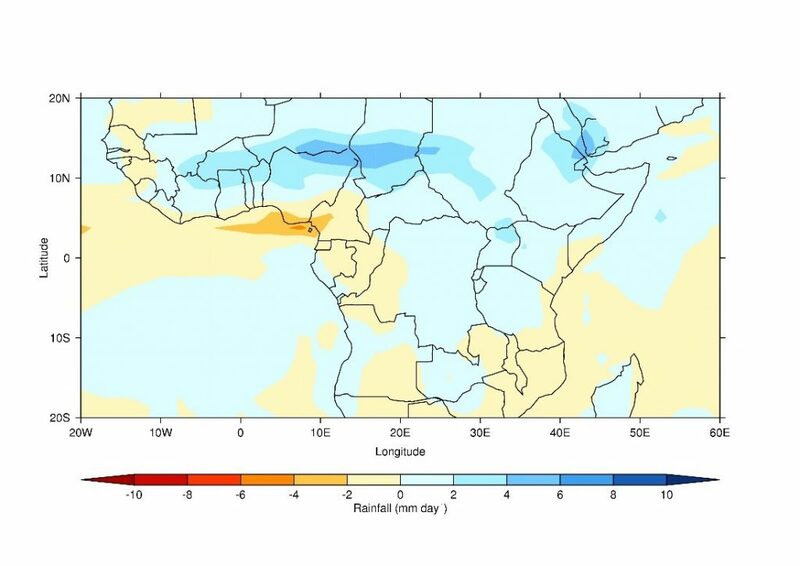 Over the summer, my intern and I worked together, focusing in particular on a reasonably well understood physical process within the WAM, namely the West African dipole; this is one of the main patterns of rainfall variability across West Africa, and is characterised by positive (negative) rainfall anomalies over the Sahel and negative (positive) rainfall anomalies along the Guinean coast, associated with negative (positive) SST anomalies in the Gulf of Guinea and equatorial eastern Atlantic (Lough 1986; Janowiak 1988; Cook & Vizy 2006). Several interesting results were found, and although the questions were not entirely resolved within the duration of the UROP placement, sufficient progress was made such that the findings are now being written up for publication. There are numerous benefits to UROP, both for the student and for the supervisor. For the student, they will hopefully gain many transferable skills, interact with the research community and learn what it is like to be an academic. If the student is interested in a career in research, or is just contemplating postgraduate studies, it provides them with a taster of what full-time research can be like. For the supervisor, it allows an extra ‘pair of hands’ to join your team, for example by conducting research to aid and supplement your existing research or by allowing a pilot project to run. Personally, I found it a very rewarding experience, and very much hope to get a decent paper out of the project – with my intern as co-author, of course! This entry was posted in Africa, Climate, Climate change, Climate modelling, Monsoons, University of Reading. Bookmark the permalink.